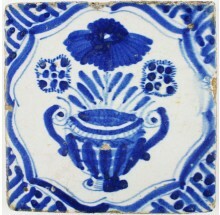 The flower vase is one of the earliest decors found on Delft tiles, as early as the end of the 16th century. There are thousands of variations, of which some stand out in quality or unique figures such as dates, decorated vases and rare flowers. For people in the seventeenth century the case of flowers was a Vanitas symbol. A symbol referring to the shortness of life. 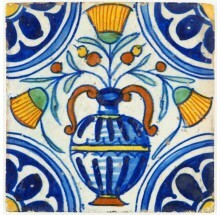 A cut flower wilts within a few days, in contrast to the glaze tile. 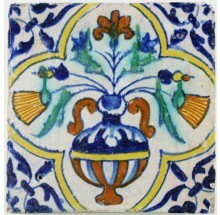 Make sure to check out our Delft wall tiles tiles and tile murals with flower vases in this category as well. 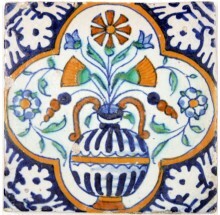 If you have any questions about Delft tiles with flower vases or if you are looking for a specific kind, please do not hesitate to contact us. Click here to visit our contact page.